More Than A Quarter Of Team Canada’s Athletes Are From B.C. VANCOUVER, B.C. — The grassroots, community-based approach that British Columbia has pioneered to support athletes and coaches in achieving their goals is one that is highly unique, and clearly working. Team Canada has nominated 225 athletes, and 63 of those athletes, a remarkable 28%, have a connection to B.C. The number of B.C. athletes representing Canada in PyeongChang is significantly higher than in Sochi four years ago, where only 19% of Team Canada had a connection to B.C. The province’s contingent at the 2018 Olympic Winter Games is even more noteworthy considering that B.C. only accounts for 13% of the country’s population. “viaSport is proud to be guiding the provincial sport system to build a stronger, more inclusive environment so that all British Columbians have the opportunity to achieve their best via sport, including these incredible B.C. athletes on their quest for the podium,” says viaSport CEO, Sheila Bouman. B.C. athletes and coaches heading to PyeongChang represent 16 different communities across all regions of the province. Some of these athletes were born and raised here, and numerous others have come to take advantage of the first class support and training facilities available to them in the province, as witnessed by the seven national teams who have chosen to make B.C. their home base. Heading to the Winter Olympics for the third time is Kelsey Serwa, a prime example of an Olympian who has benefitted from the support B.C. provides its athletes, at a number of levels. A native of Kelowna, ski cross athlete Kelsey grew up enjoying the world class slopes that B.C.’s mountains offer. 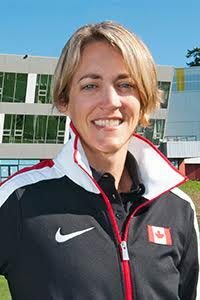 In recent years, she has received integrated support team (IST), sport science and sport medicine support at Canadian Sport Institute Pacific’s Whistler campus. Having competed at both 2002 BC Winter Games and the 2007 Canada Winter Games, Serwa was named Honorary Captain of Team BC at the 2015 Canada Winter Games. Serwa tried ski cross for the first time in 2007 when she was 18 years old. With only a couple of years of experience in that specific discipline, she made her Olympic debut at the Vancouver 2010 Winter Olympics, in conjunction with ski cross’ Olympic debut that year. Although missing the podium with a fifth place finish and deterred by several major injuries in the years that followed, Serwa relentlessly persevered to capture silver at the 2014 Sochi Winter Olympics. Other B.C. athletes off to the Winter Olympics, which viaSport and its partners have profiled regionally, are Jamie Macdonald of Fort St. James (speed skating, short track), Larkyn Austman of Coquitlam (figure skating), Josie Morrison of Kamloops (speed skating, long track), Spencer O’Brien of Courtenay (snowboarding, slopestyle), Yuki Tsubota of Whistler (freestyle skiing) and India Sherret of Cranbrook (ski cross). 18 coaches have a connection to B.C. The British Columbia sport system is a critical component of the athlete and coach development pathway. The sector as a whole is looking forward to cheering on our B.C. Olympians at the PyeongChang 2018 Olympic Winter Games, which run February 9th – 25th.